I. Re-establishment of the l.o.u.n.g.e. In early 2007, the Georgia Tech Department of Housing decreed that the then-current location of the l.o.u.n.g.e. 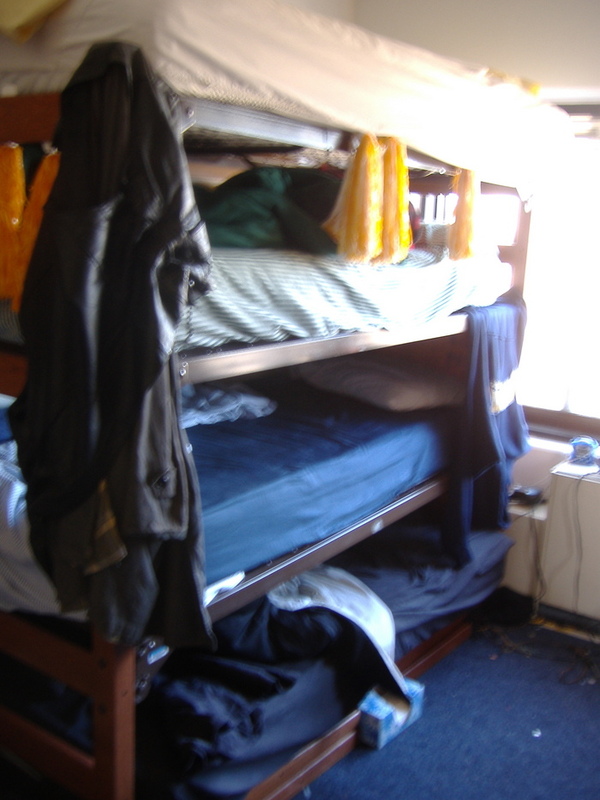 was to become a freshman-only dorm. Despite much complaining, gnashing of teeth, and attempts to inject common sense into the Department of Housing, the denizens of the l.o.u.n.g.e. were unable to reverse the decision. In August, the old l.o.u.n.g.e. was dismantled overnight, at the expense of its residents' sleep. 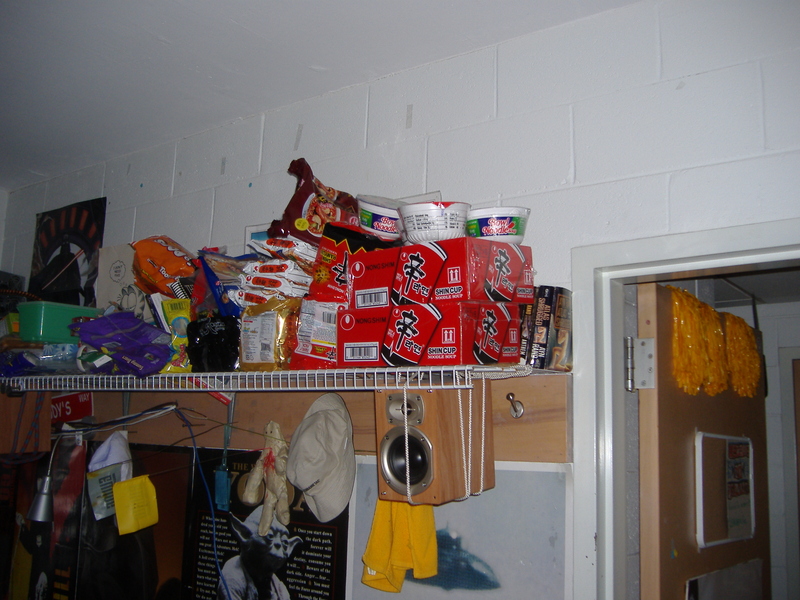 Then, the collected contents of the l.o.u.n.g.e. were thrust onto the sidewalk outside the new building which was to contain the new l.o.u.n.g.e., which was approximately 500 feet away. 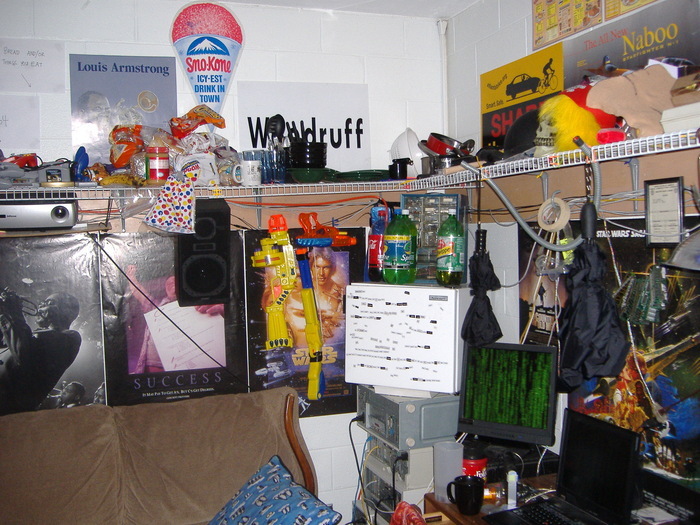 This splattery of objects, seen in Figure 1, was slowly moved into the new l.o.u.n.g.e. and unpacked. However, this splattery could not be left unattended. Figure 2 details the methods used to guard the contents of the l.o.u.n.g.e. from vandals, kleptomaniacs, and money-desperate celebrities. 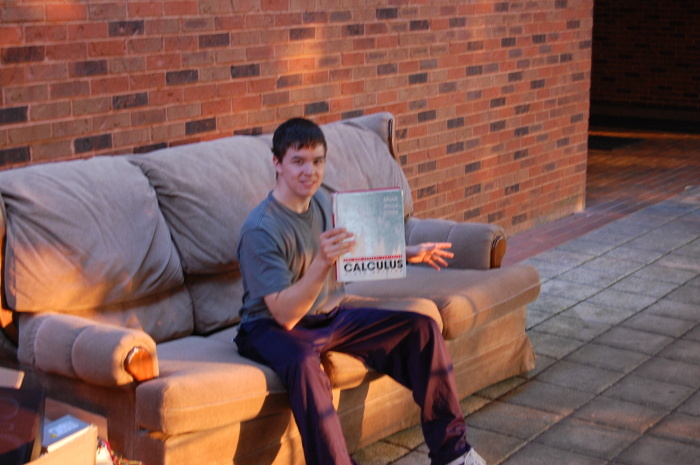 The then-current guard proudly displays a Calculus book, doubling as both defense weapon and knowledge portal. Figure 3 shows the l.o.u.n.g.e. 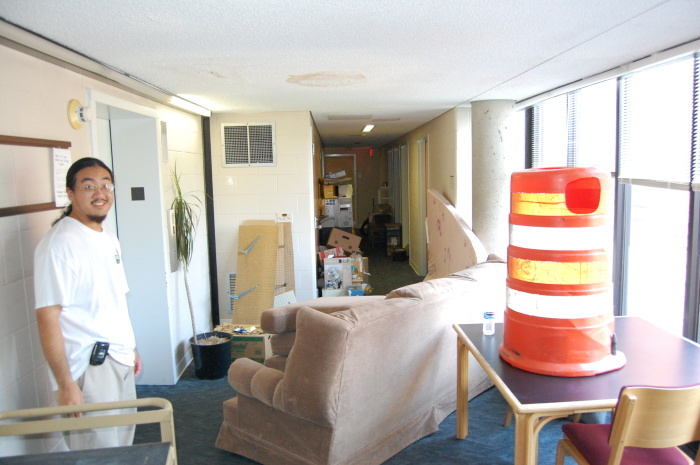 contents being moved inside the new building. A fellow geek and LUG member who is apparently allergic to cameras can be seen, presumably admiring the absurdity of the situation. Soon, the new l.o.u.n.g.e. was established, being clearly superior to the old l.o.u.n.g.e. in every way. Figure 1. An increase in the entropy of Georgia Tech. Figure 2. 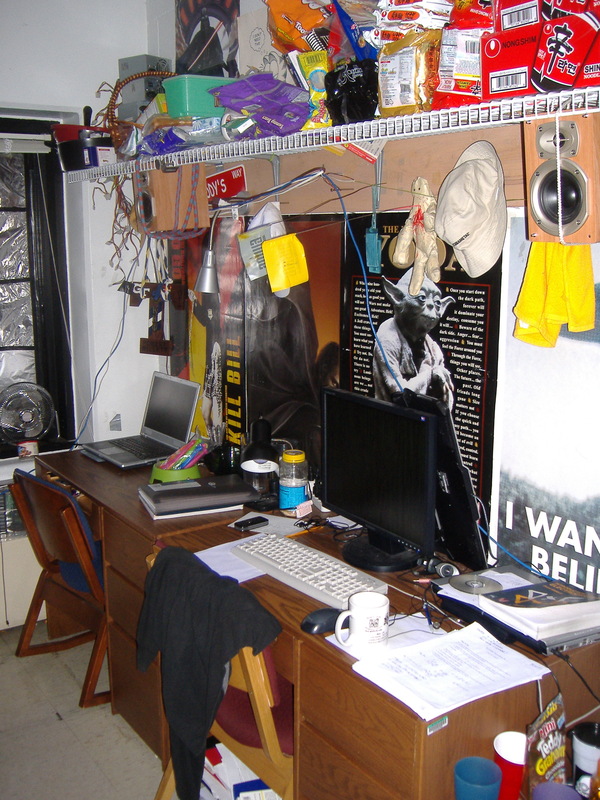 A prominent hobby among especially neurotic Georgia Tech students. Figure 3. An emergency barrel, obtained in a perfectly legal manner. The main improvement in the new l.o.u.n.g.e. 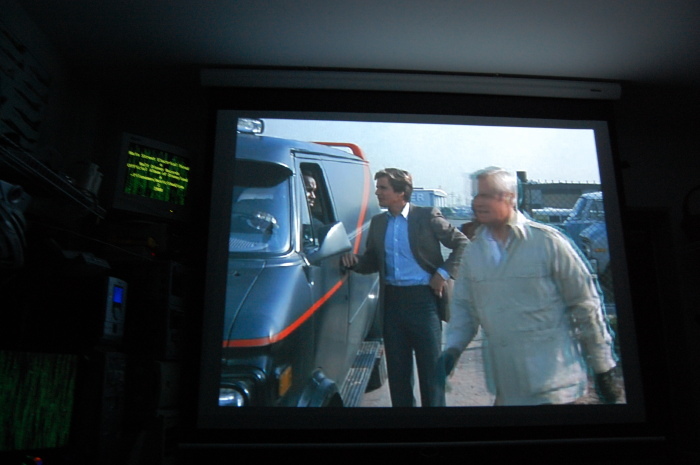 was the purchase of an InFocus IN26 projector  and 100" retractable screen, hung from the ceiling. The couch was moved to support the larger screen, such that the distance between the couch and screen was a maximum. 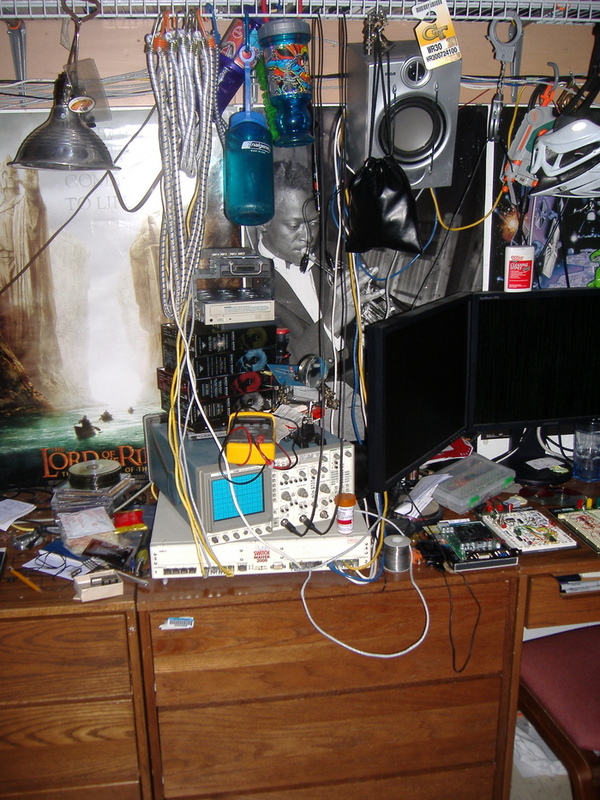 Other items obtained for the room were a few more computers, an oscilloscope, and a better speaker configuration. 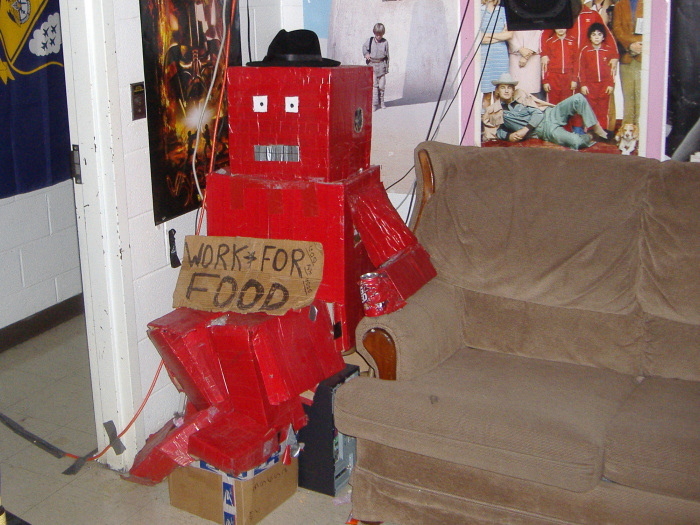 The robot, 'bigred', was also placed in a better chair and given a can of Big Red . Its internals were reconfigured such that its hard drives would not consistently turn into molten metal. 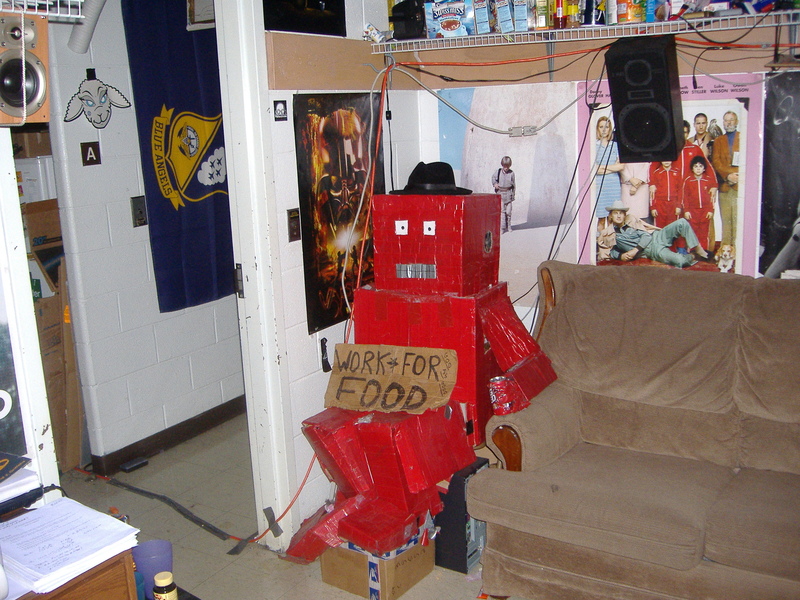 Images of the new configuration of the couch, robot, and functioning projector screen can be seen in Figures 4 and 5. Figure 4. 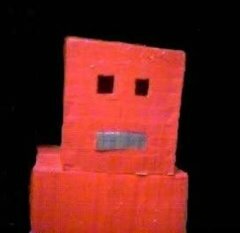 The most prominent denizen of the l.o.u.n.g.e. enjoying his favorite drink. Figure 5. The A-Team bestowing their knowledge upon the l.o.u.n.g.e. and its inhabitants. Figure 6. 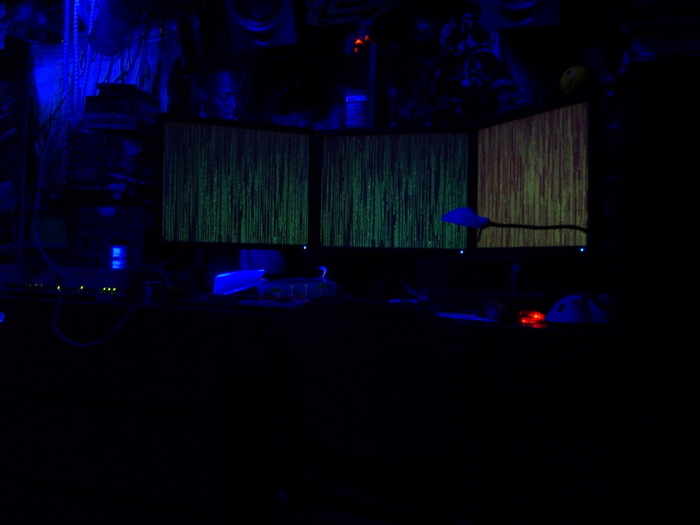 A few of the monitors on which this page was created. Figure 7. 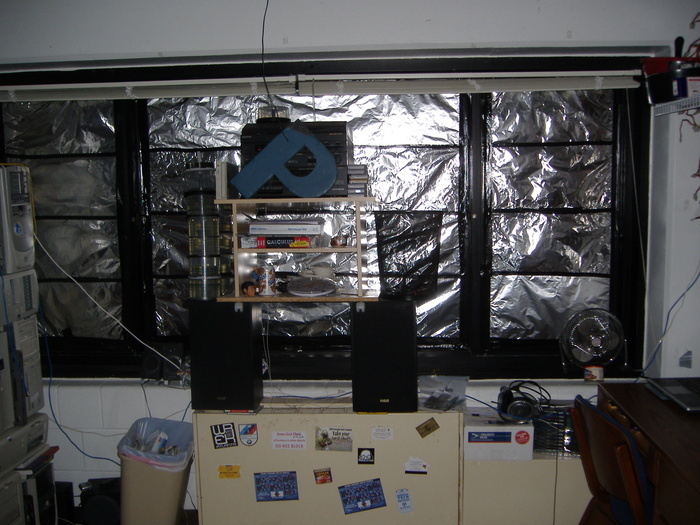 A fire hazard, indicating that the current music playing is by Scientist. Figure 8. The venerable movie player, enjoying the company of both Anakin and Eli Cash. Figure 9. 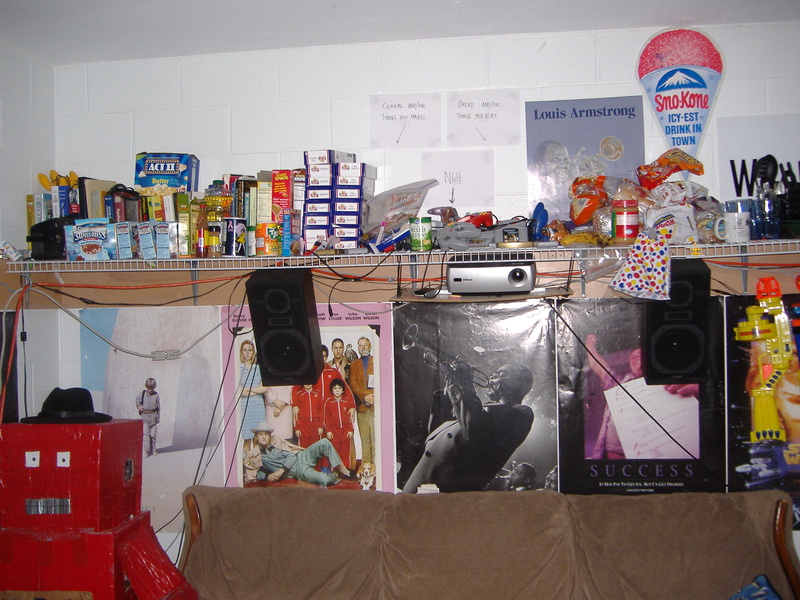 The carefully maintained Nerf arsenal lies below the food shelf; note the large amount of spaghetti (30 pounds). Figure 10. Precarious speakers mounted over the couch serve to keep those who do not trust mounting equipment from sitting on the couch. Figure 11. 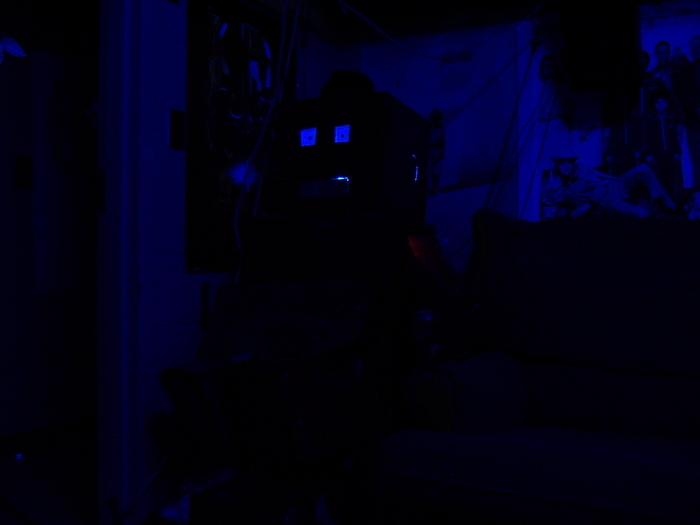 The projector hangs directly under the N64 and GameCube, causing absolutely no heat dissipation problems at all. Figure 12. The soda fridge, above several computers, holds on its door handy english phrases, such as ``I'M BUZZED LET'S DRIVE''. Figure 13. 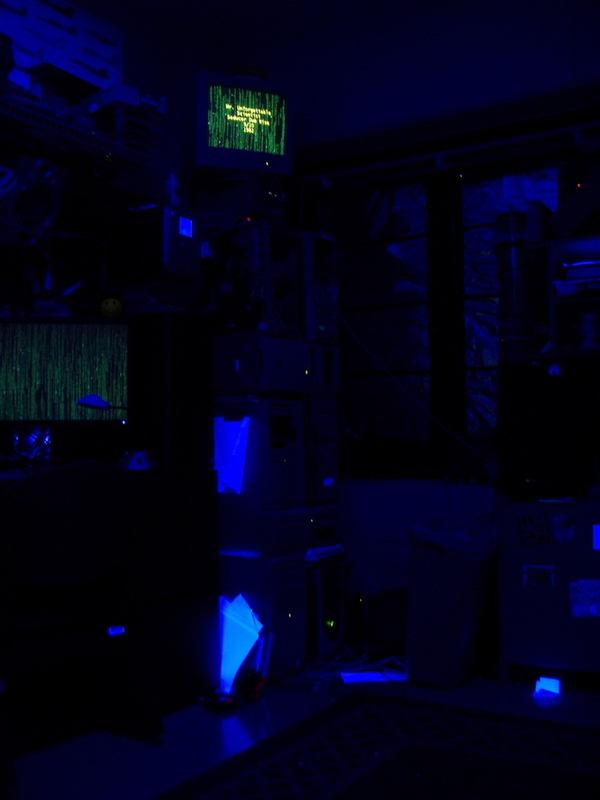 An oscilloscope, which could make a cool visualization if hooked up to the music. Figure 14. 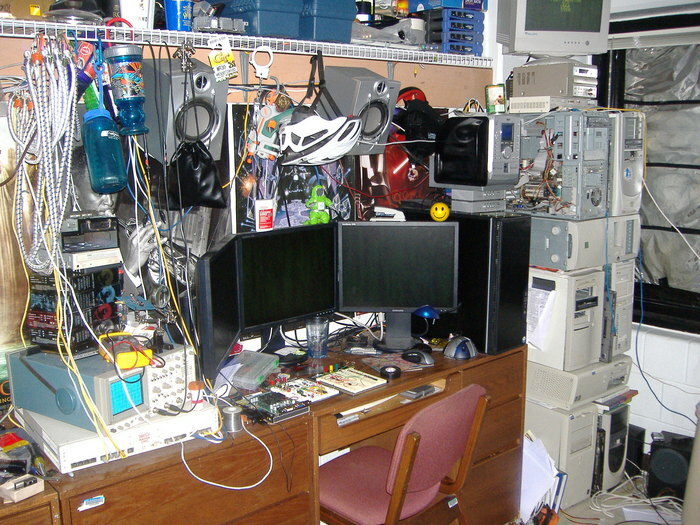 Precariously balanced computers, which serve the site you're looking at. Figure 15. The cord from above is the projector handle. Note the foil-covered windows, to prevent unwanted bright light from outside from entering. Figure 16. Yoda, the spiritual guide to the l.o.u.n.g.e., looks upon us and helps us with physics. The Force, mass times acceleration, is. Figure 17. Fuel for the inhabitants of the room: exotic spicy ramen imported from the Far East. Figure 18. 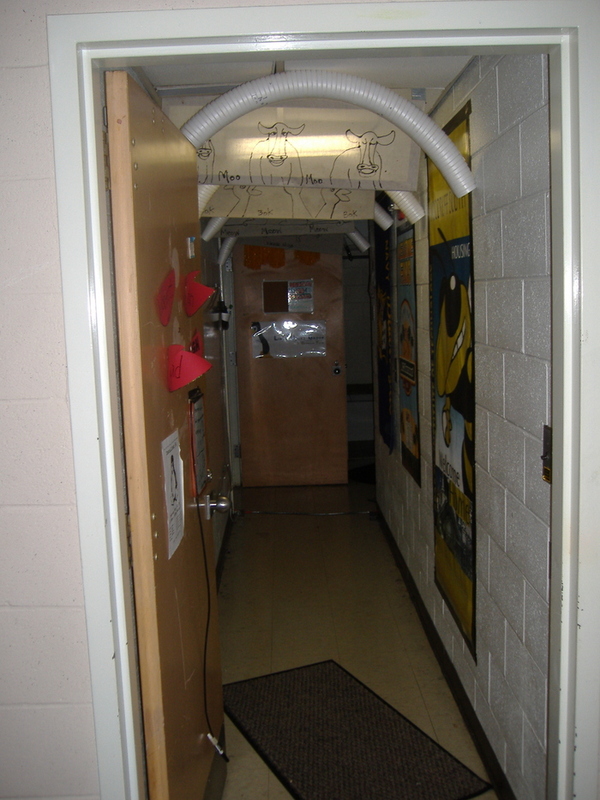 The entrance to the l.o.u.n.g.e., complete with dining hall styrofoam cup arches. Figure 19. 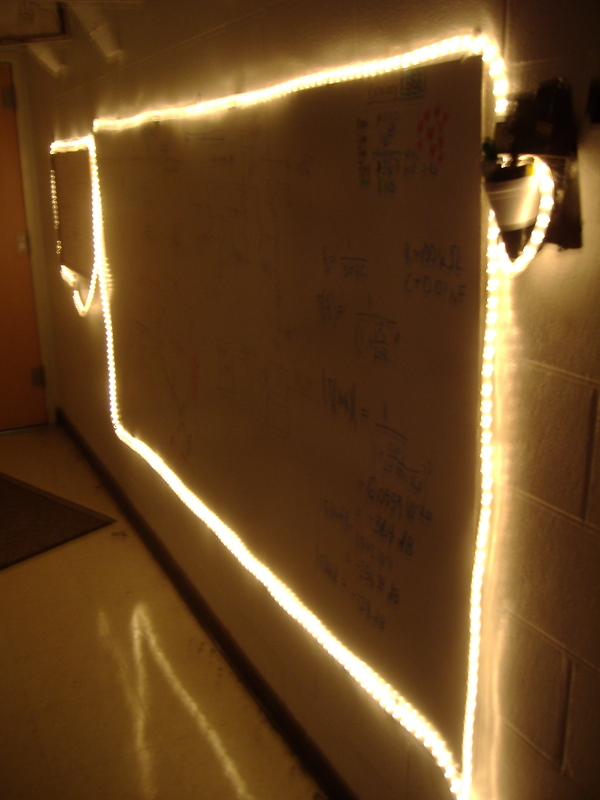 The whiteboard in the hallway, creatively lit with rope lights. Figure 20. The sleeping quarters. Space-efficient and just as comfortable as a five-star hotel. Figure 21. 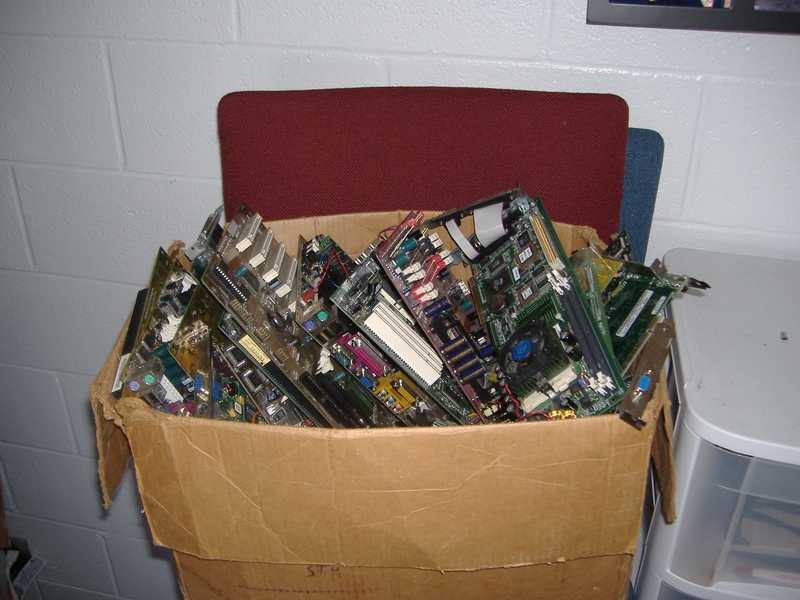 Spare computer parts, stored carefully to prevent any possible damage to the motherboards. Figure 22. An elusive tradition of the l.o.u.n.g.e. 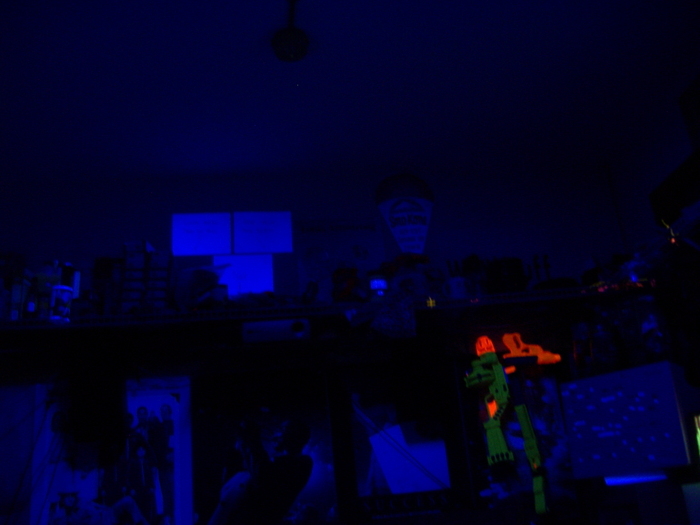 : DTR (Disco Techno Rave), captured on film. 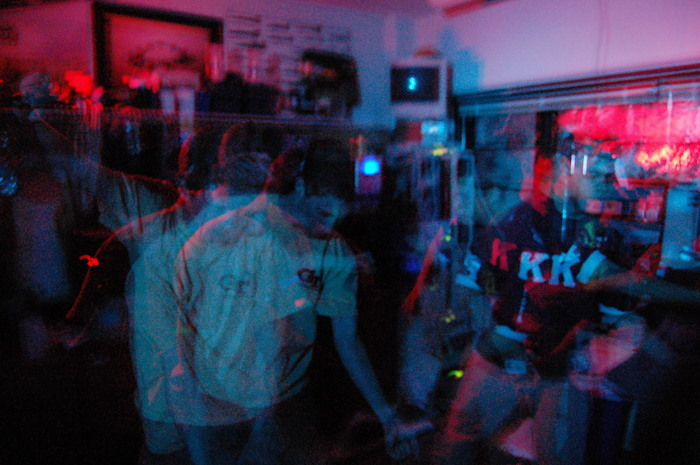 Loud music, colored strobe lights, thumping bass, and a psychedelic atmosphere; guaranteed to eliminate any worried parents' fears that their children may have started taking psychedelic drugs upon leaving for college. At the end of the year, it was decided that the l.o.u.n.g.e. should move to apartment-style housing. More information on this endeavor can be found on the "2008 l.o.u.n.g.e." page . Back to the 2006 l.o.u.n.g.e.! On to the 2008 l.o.u.n.g.e. !